You scream, I scream we all scream for cosplay teams! Don't ask me how I come up with the introductions to these posts, I claim part genius part bourbon, but really they come to me in a vision, which is like a Mazda but made of clouds. While I refine mixing metaphors, indulge yourself in these cosplay teams! What I wouldn't give to run around in that Sasquatch. At the grocery store I could take 13 items through the 12 items or less isle and no one would nag! Alpha Flight's Northstar and Aurora look more smokin' than siblings should be aloud to be, and while Snowbird looks like she can't wait to get the photo over with, Shaman proves a Cher wig has more than just one use. Sitting felony for felony in terms of comics best rogues gallery, The Flash's foes captured here on Instagram make for an awesome combo. While some might think Pied Piper has Mirror Master on a leash, I'd just say pay more attention to where the Scottish thugs fists are aiming - they look pretty lethal! Back on the Marvel side of the fence, it's the original X-Men! Marvel Girl and Cyclops look like a couple, Iceman, cool as ever and Beast is showing his Down-Under appeal, sporting a pair of jandals. Nothing says 'team' like unified colours, oh and a badge. Everyone loves badges. Great, now I'm limited to really tiny words. In all of comics I can't think of a harder team to be than The Fantastic Four, yet this crew does brilliantly. The Human Torch shows spray tan overload can be a positive, while the idea to place shields on Sue's hands is genius (until she goes to eat or drive that is). While Reed could've joined the greater commitment and walked around on stilts, the fact he didn't, proves he really is the smartest dude alive. Awwww- I appreciate the effort. But as far as cosplay goes: LOL. The FF is the best, though. Very nice way to do/represent Johnny and Sue's powers. That Sasquatch, though! Cant stop laughing at that Sasquatch! 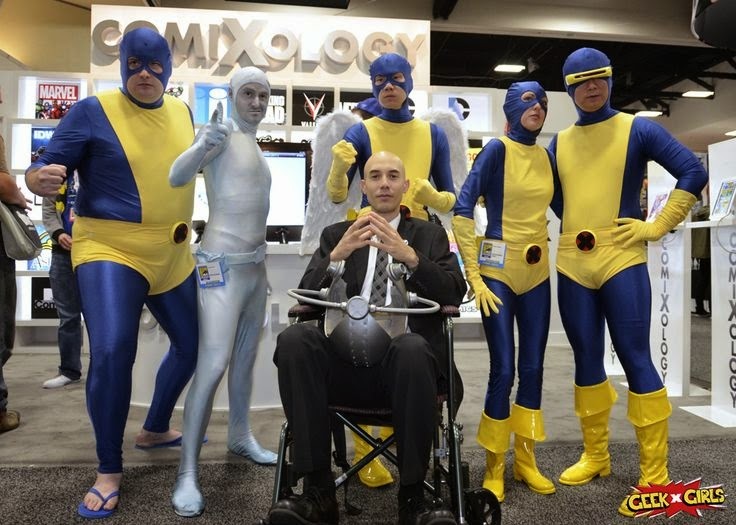 The X Men look a little like those guys from the BIG bang theory. I do love love love that FF cosplay though. Where I live everyone puts on SO much spray tan it would make the Human Torch cosplay here look positively anaemic (!). WOW. Just....wow. Major props to all who participated, but The Rogues and Alpha Flight w/Weapon X Logan takes the the prize for me. Thanks guys! I think I'm with you Dale - the others are both awesome, but Alpha and the Rogues aren't regular choices so they just edge ahead. Just don't tell Marvel they can have Multiple Wolverines on a team - we'd really be sunk! Karl, I've lived in tan-gerine towns before too so I know what you mean :-) One day they'll look back in regret painting their skin like an onion ring, I just wish it was today. Hey Dan, just going back through your cosplay archives looking for (and finding) many of my friends. My buddy Allen Hansard is the guy in the Sasquatch suit. He actually won a contest with that one. He's the fella in charge of wrangling those giant photoshoots at DragonCon you may have seen pics of from time to time. I'm The Thing in that FF group, my wife is Sue Storm, and my friends Ned and Aaron round out the lineup. That was a very interesting project, that group. Hottest outfit I've ever worn in my life, by FAR! As a huge Alpha Flight fan Supernova, your buddy's efforts are greatly appreciated. That looks awesome! You are right, that Thing suit looks like a boiler maker. Thanks for providing the background to these images mate, and please feel free to keep us up-to-date with what you cosplay as next!